Want to know the Arizona Game and Fish Commission’s stance on various issues affecting wildlife conservation and outdoor recreation? This page includes links to official commission resolutions, policies, editorials, and other commission activities. Commission Resolution concerning the loss of multiple-use public lands due to special land-use designations. Testimony of AZGFD Director Larry Voyles before the Senate Committee on Environment and Public Works (“Conservation, Consultation and Capacity: States’ Views on the Need to Modernize the Endangered Species Act”). May 10, 2017. View the video. Director Voyles’ testimony runs from 1:04:45 to 1:09 54, followed by a Q & A. Stop and consider: A “monument”-al mistake? The Arizona Game and Fish Commission Awards Banquet was Jan. 16, 2016 at the Arizona Grand Resort in Phoenix, and was one of the best yet! More than 280 people attended to honor their fellow conservationists who received 2015 Commission Awards. 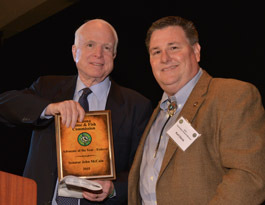 The purpose of these awards is to recognize Arizonans who have contributed significantly to the conservation of the state’s wildlife, its outdoor heritage, and the mission of the Arizona Game and Fish Department. Among those honored this year were U.S. Senator John McCain, Arizona House Speaker David Gowan, Sr., Arizona Attorney General Mark Brnovich, and Mohave County District 2 Supervisor Hildy Angius. Media of the Year: Rosie Romero Jr. The Arizona Game and Fish Commission thanks you all for your contributions to wildlife conservation and our outdoor heritage!